sisters garden: Hints of Spring! 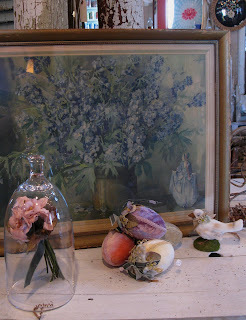 Vintage-look velvet eggs, new cloches, antique picture with Spring print. 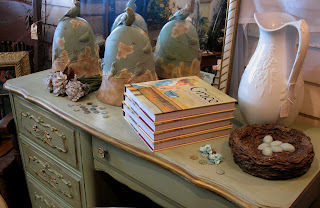 French Blue desk, ironstone pitcher, terra cotta bell cloches and new "Grace" books . 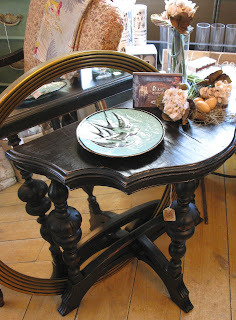 . .
Vintage end table painted black, just in today . 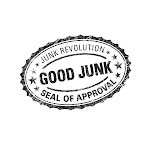 . . with gatherings of Spring arrivals! 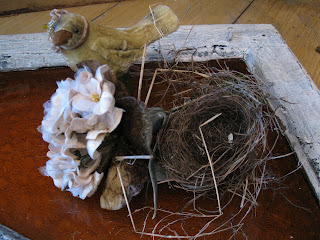 Velvet posies and birds - vintage look . 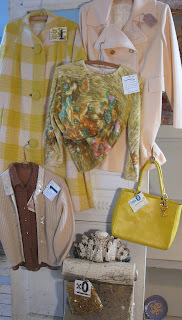 . .
Sportin' the vintage goods, fabulous colors! It all looks amazing, I gotta get up there! Just listened to the words...sweet song, does bring a tear...but then, you know me!!! Was great fun today, shop looks great as always!!! You da Bomb!!! hi barb, i was on sharons blog and she had a picture of that wicker lamp(tall) how much is it? also love that lilac pic. beautiful! !